Speare Seeds pride themselves in putting the best seed into our mixtures by using certified seed in our proven and successful bulk bin program. Our mixtures contain top-ranked varieties in national trials. You can be certain about the quality of certified seed in terms of purity and pedigree, because it is produced under stringent conditions. It is tested and graded by accredited experts. Selling certified seed to your customers gives you peace of mind that your seed is of the highest purity and you are selling your customers the best quality product. Even when common seed is included in a mixture, Speare Seeds will hand pick the different seed lots to ensure that you are receiving the highest quality. Speare Seeds offers a wide variety of mixtures that can be used in a bulk bin. Mixtures can be designed specifically for your location and your needs. For custom mixtures, we can provide you with a customized lid label, complete with your company's name and the name of your seed mixture. Biodegradeable seed bags (150/bundle) are supplied with each bin. Designed for all soil conditions and performs well in dry, sandy soils. Less watering than regular grass seed mixtures. Mixture named for its premium quality and excellent turf performance. Contains green colour coded seed for easy identification in bulk bins and/or during planting. An economical, multi-purpose lawn grass mixture. Low maintenance mixture ideal for large properties, playgrounds and cottages. Offers quality turf grass at an affordable price. 100% Certified seed in mixture. Deluxe mix for professional quality lawns. Can be used in all sun or moderate shade. identification in bulk bins and/or during planting. Adapts well to less fertile soil conditions. Contains red colour coded seed for easy identification in bulk bins and/or during planting. Endophyte Enhanced Mixture – A natural way of reducing the risk of insect infestation. TURF GENIUS® – Guaranteed 100% certified seed in your mixture. 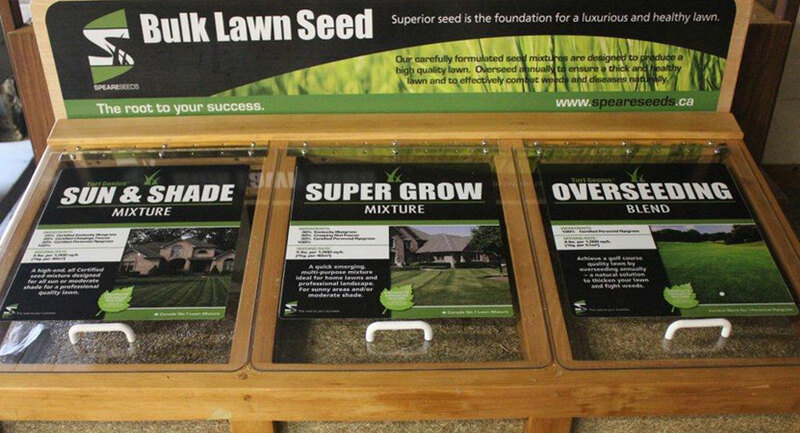 Call one of our turf specialists to see which mixtures would be best suited for your area and soil conditions.